Raise your hand if your behind on blog posts… No? Just me? Better late, than never right ladies! I am also late to the whole making a collage in photoshop, lets just say this took me two hours, so I’m really proud of it and couldn’t wait to share! 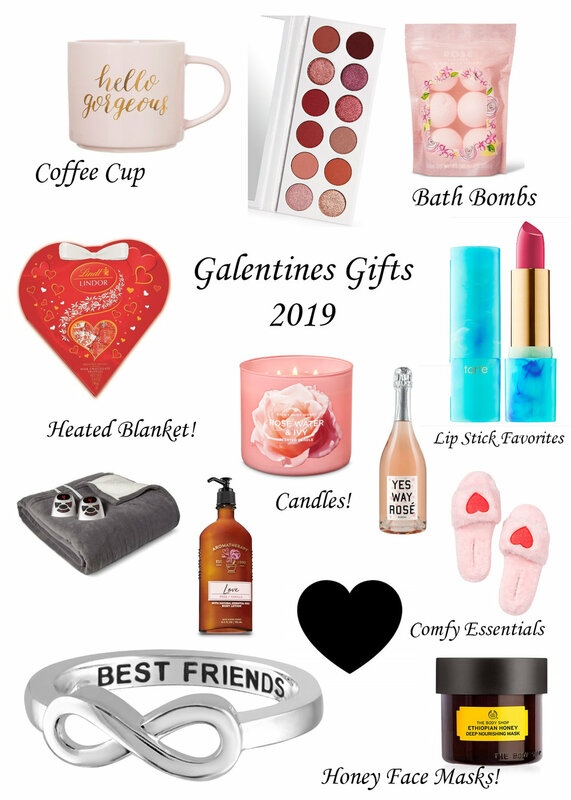 Today I wanted to share some super affordable Galentine Gift Ideas with Valentine’s Day being a week away! I love showering my friends with love and treating them to some goodies! So here’s a few of my go-to gifts that everyone loves! Tarte Lipstick: I love this lip color so much! It’s a sassy pink that every girl needs to wear when they need a little pick-me-up! This is the shade Popsicle, which I mean seriously, how can you not have this in your life! Hello Gorgeous Coffee Cup: I love this coffee cup so much! This is perfect to gift for your girl who needs that extra love in the morning to get her through the day! Honey Face Mask: one of my favorite masks from The Body Shop! I love how this makes my skin feel! Rosé: Get drunk with your girl and do some online shopping. This is a MUST! Kylie Burgundy Eyeshadow Palette: I love the tones in this palette! It’s a little on the more expensive side, but your girl would love it!! Heated Blanket: nothing says friendship like a heated blanket and face masks. Candles: This scent from Bath and Body Works is one of my favorites! It’s to die for! Best Friend Ring: such a cute, personal gift to give your gf! Bath Bombs: how can you say no to bath bombs! They make everyone happy! Body Lotion: This lotion ladies. Let me tell you. I love it so much! I am obsessed with the Aromatherapy from bath and body works. The rose oils inspire connection and self confidence. Vanilla calms the mind to encourage relaxation. This is my all time favorite! COZY Slippers: what I love about these slippers is just because they have hearts on them, doesn’t mean you can only wear them over V-day! They are super cute and can be worn every. single. day! Box Of Chocolates: You can never go wrong with a box of chocolate! The thought goes a long way, and who doesn't love chocolate! I hope you all have an amazing weekend! These super affordable gifts are perfect for your bff who you wanna shower with love!